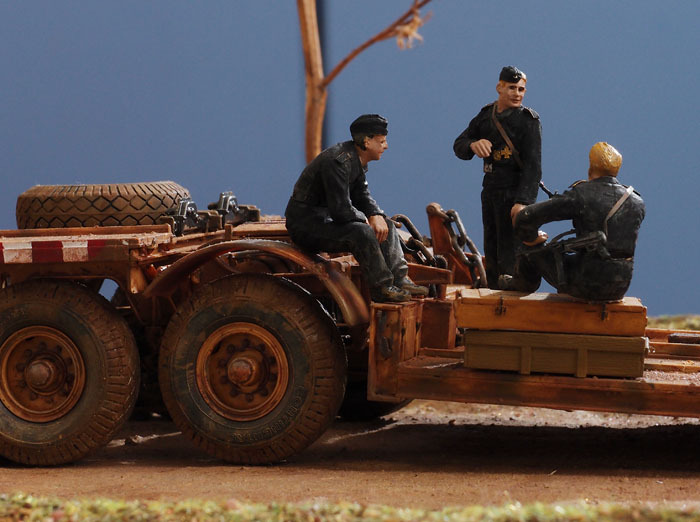 One of the popular presentation format for some modellers, especially those building land-based vehicles and figures, diorama needs as much attention in photography as the model itself. 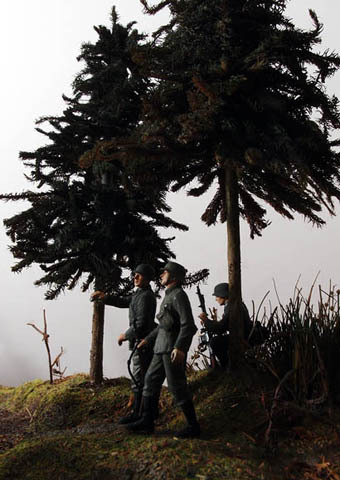 Photographing a diorama will be nothing different than photographing a model, therefore all of aspects mentioned in previous chapters should be applicable, and more. 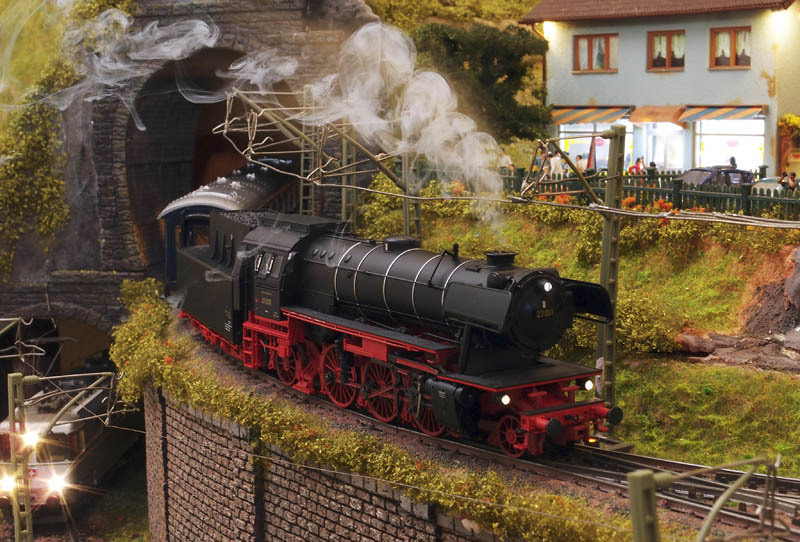 Ideally, a diorama photograph should portray a "make believe" picture, causing the viewer to think whether it was real. In order to achieve that, we need to pay attention to the depth of field, direction of light and background. Usually a diorama will need wider depth of field than a single model, thus will benefit from the small sensor size of compact digital camera, in fact all of photographs in this page were taken using compact digital camera. (If you need to know more about depth of field, please go to chapter 5 ). Shallow depth of field on diorama photo will result in a less convincing picture. Before continuing on the light direction and background, let see one shooting trick using mirror which sometimes may be useful in photographing diorama. There are times when we want to take a photograph from certain angle, but was obstructed by another unmovable object on the diorama. In this situation, a mirror may come in handy. For example, I wanted to take picture of a station platform, but there was another platform obstructing the view (see the photo on the left). So I put a small mirror angled around 45 degree, and shoot from above. The photograph below was the result. Always choose a good quality mirror. A good quality mirror will have less "ghosting" (faint lines surrounding bright objects), therefore will result in sharper image than a worse quality mirror. And always clean the mirror before using, a speck of dust on the mirror may be shown up as a blurry dot on the photograph. 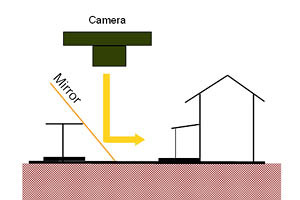 Another thing to remember when using mirror is: flip the result photograph in the computer, because the image captured by camera thru mirror is a flipped reflection; left become right and vice versa. 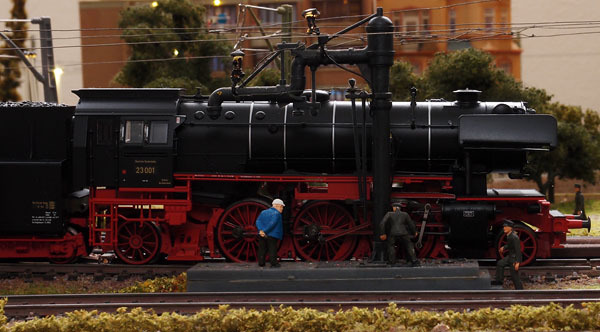 Background will always play an important part on any miniature photography, especially in diorama. 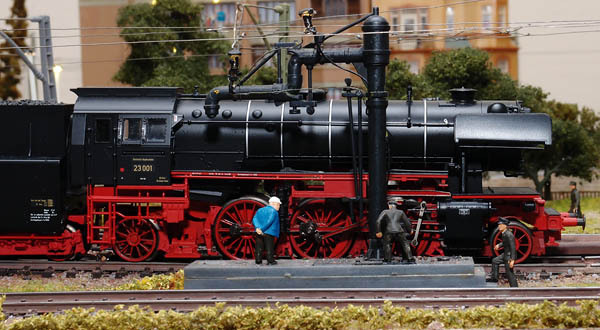 As a diorama photograph was created to mimic a "real life" image, therefore a cluttered background will certainly deprive its impressiveness. Some people will put pictures of sky with some clouds, or scenery, as their backgrounds. But you do not need going to such extend. A plain background will do. The most important thing to remember is: avoid cluttered background or showing part of your room inside a diorama photograph. You can use a plain wall, sheet of paper, or linen, as the background. Lets see at the example below; the leftmost photo was created without observing the background. 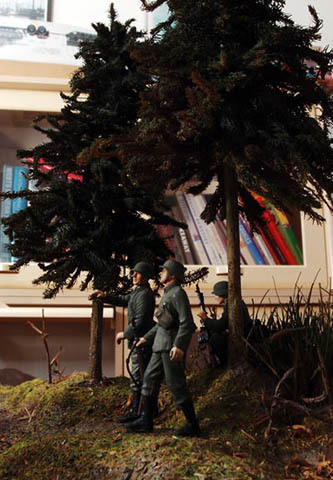 As the result; a bookshelf behind the diorama was captured in the photo. Now look at the middle and rightmost photos. Both of them show the same diorama at the same place, but a sheet of paper was used as the background, a white paper and black paper respectively. Clearly the plain-backgrounded photographs look more appealing. 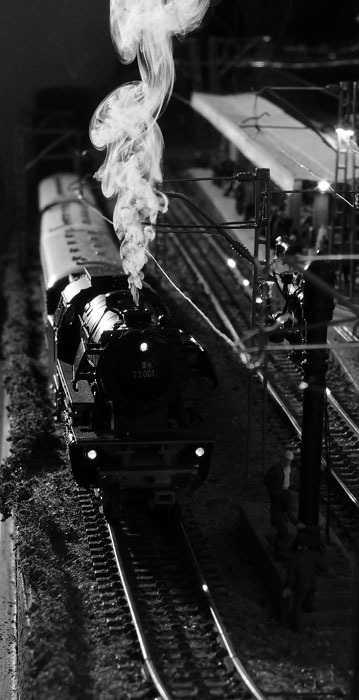 In a diorama, the direction of light should reflect the direction of sunshine as intended by the photographer. 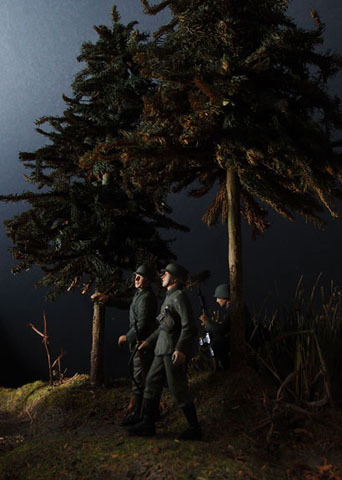 Therefore think your main light source as the "sun" of your diorama. 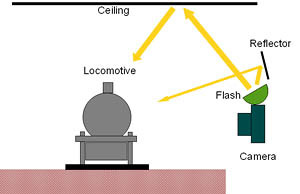 Diffused lighting will create a similar condition as overcast or cloudy day. Although there is no rule-of-thumb on the position or direction of light, however, there is one direction which strongly advised to be avoided; the frontal lighting. Most of diorama photographed using the camera's built-in flash, will yield unsatisfactory results. This photo was taken using external flash mounted on the camera. Frontal lighting. Although it is slightly better than using the camera's built-in flash, but the frontal lighting still result in "harsh and flat" looking photograph. This photograph was created using external flash mounted on the camera, but tilted upward to bounce on the ceiling, with a small reflector to provide fill-in light. The result was a diffused lighting. With the light source was located behind the object (but outside the camera's viewing angle), this is a back-lighting. This kind of lighting may work dramatically on some composition, but may not work on another. So this is a "hit-and-miss" option which you may sometimes consider. The black-and-white photograph on the left is an example of backlighting method. 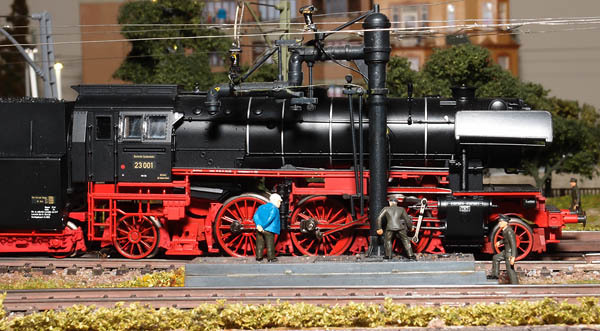 It shows a 1/87 scale DeutscheBahn Class 23 locomotive running on the lay-out. 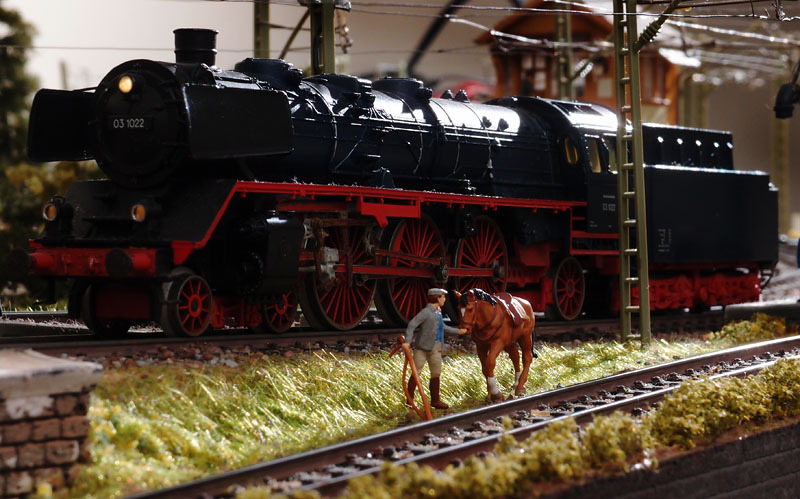 While the photograph above, showing a 1/87 scale DeutscheBahn Class 03 locomotive and a horse with its handler. 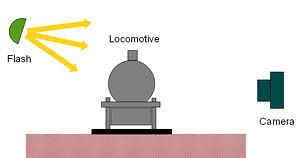 The light was coming from behind the locomotive (upper right hand corner of the photograph, outside the viewing area), imitating an early morning sunlight. The two photographs below demonstrate the effect of diffused-lighting versus back-lighting, well, in this case; side-lighting. 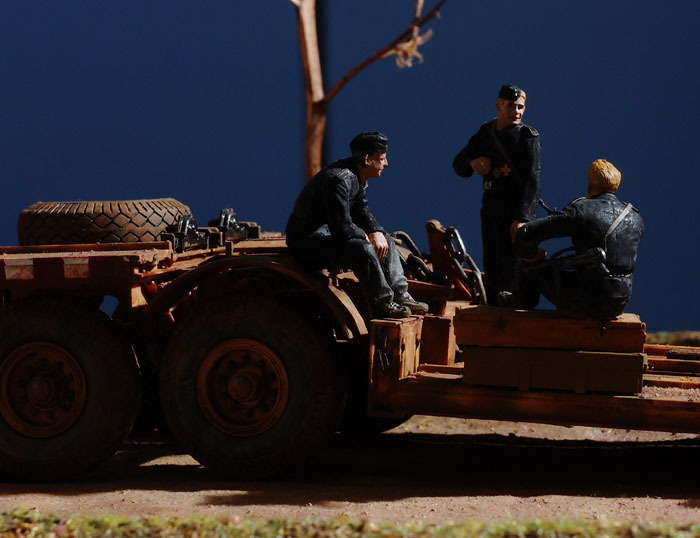 Three german WW II tank crews chatting on top of a Sd.Ah.116 trailer, in a 1/35 scale diorama. The diffused lighting gave a good overall appearance, while the side-lighting gave a "night effect". Please note the background; a plain light-blue colored paper was used. The light-blue color became dark-blue since not much light bounced off the background in side-lighting. 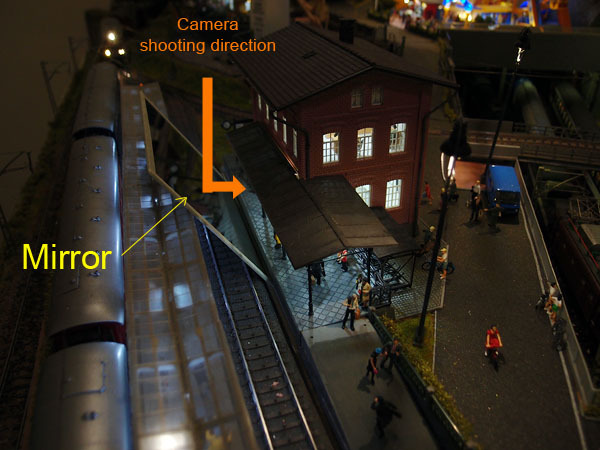 Sometimes certain objects within the diorama (cars, train carriages, buildings, etc.) emit lights, or have interior lighting. We may want to preserve that lights in the photograph to show. This can be a bit challenging considering the lights are usually not bright enough. This is a 1/87 scale of SBB salon coach. It had passengers sitting inside, and interior lighting from low-powered LEDs. The first step is to get the correct exposure of the interior. Reason being; I can not adjust the brightness of it, while I can adjust the brightness of exterior light (or flash). The photograph on the left was the result. Once I got the correct exposure for that interior, then I start to increase the exterior lighting. In this case, I used manually adjusted flash. while photographing the above coach, I found out that f/5.6 at 1/20 second (ISO 100) was the correct exposure for the interior. Therefore I set the flash to 'A' (auto mode) at f/5.6, and shoot. The photograph below was the result. Photo on the left is another example of preserving the interior lights, but since it portray a night scene, therefore no exterior lighting was being used, apart from the dim room light. This photo was shot thru mirror. 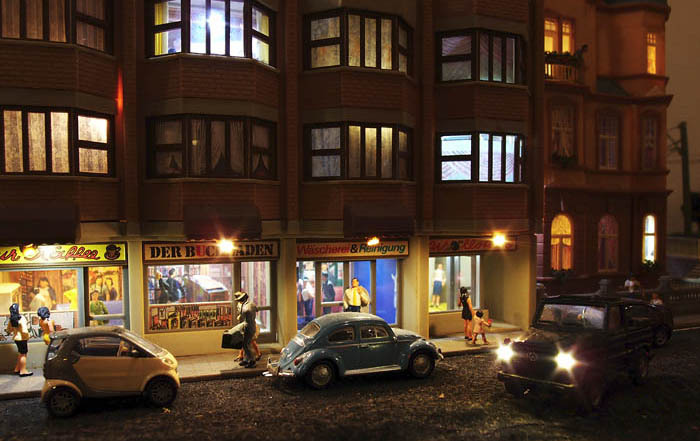 1/87 scale street scene with LED lights, including the headlight of the MB SUV.